US coddles fugitive mass-murdering Thai dictator while berating Syria in its desperate fight against Al Qaeda. August 14, 2012 - Starting in February 2003, and over the course of 3 months, some 2,800 people (approximately 30 a day) would be extra-judicially murdered in the cities and countrysides of Southeast Asia's Thailand. Accused of being "drug dealers," they were systematically exterminated based on "hit lists" compiled by police given carte blanche by then Thai Prime Minister Thaksin Shinawatra (a former police bureaucrat himself). It would later be determined by official investigations that over half of those killed had nothing to do with the drug trade in any way. Human Rights Watch (HRW) would confirm this in their 2008 report titled, "Thailand’s 'war on drugs'," a follow up to the much more extensive 2004 report, "Not Enough Graves." Image: "The Thai Gov'ts War on Drugs: Dead Wrong. 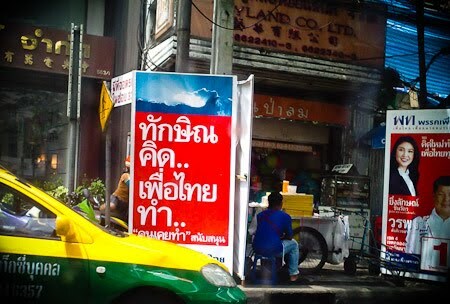 Stop the Murder of Thai Drug Users." 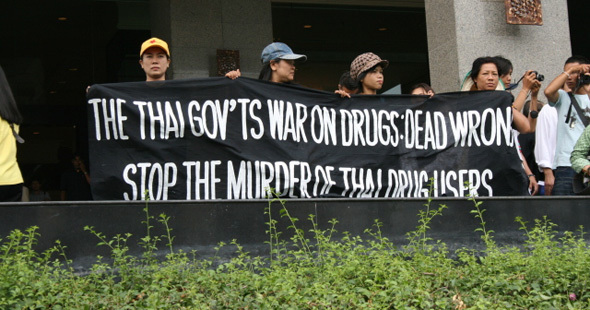 During Thaksin Shinwatra's 2003 "War on Drugs" it wasn't only drug users who were brutually, extra-judicially murdered in the streets, but over 50% of the 2,800 killed during the course of 3 months, were completely innocent, involved in no way with either drug use or trade. Thaksin Shinwatra, with the blood of 2,800 people on his hands, is now traveling freely throughout the United States with a US visa in hand. In essence a vast, nationwide campaign of mass murder was carried out, and to this day the man responsible, Thaksin Shinawatra, has never been charged by either Thai officials or international bodies. 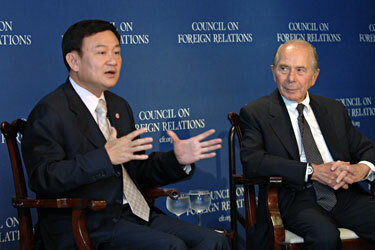 However, in 2006, after systematically dismantling Thailand's checks and balances, becoming increasingly despotic toward civil liberties (other massacres would unfold) and cracking down on an increasingly critical press, Thaksin's autocratic reign was ended by a peaceful military coup that would ultimately force him to flee the country. He sought and received sanctuary first in the United Kingdom, and now primarily resides ensconced in the luxury of Dubai, in the United Arab Emirates. Image: Vulgar display of power. The Libyan government's biggest mistake in 2011 was not fighting foreign-armed terrorists overrunning their country, but was not submitting to the will and hegemony of Wall Street and London. 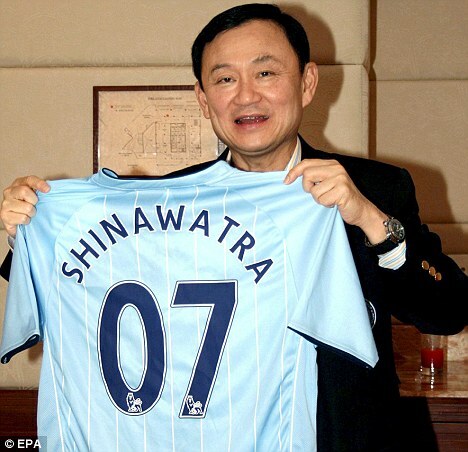 Thaksin Shinawatra, however has - and for his fealty, despite having killed 2,800 people extra-legally while Thai PM, he was allowed to seek sanctuary in the UK, and even buy a football club. Here he hoists a Manchester United jersey with his name printed on it, presented to him in a packed British stadium. Astonishingly, this despotic mass murderer was not only harbored by the United Kingdom, but in 2007 was allowed to "buyout" a British football club, Manchester City. While the BBC reported at the time that there were concerns Thaksin's source of funding might not be legitimate, as he was then under investigation for a myriad of corruption charges, the deal was allowed to proceed - no mention of the 2,800 extra-judicially murdered under his regime was ever made. 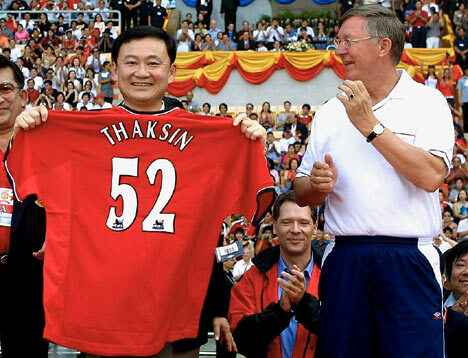 In 2008, Thaksin would be convicted and sentenced to 2 years in prison for those corruption charges. Thaksin fled Thailand before the ruling, thus becoming - in addition to a mass murderer - a wanted fugitive. While several proxy-governments have attempted to secure a full pardon/amenesy for Thaksin's sentence, one led by his brother-in-law, another, currently, led by his own sister, he has remained abroad a fugitive. With the United States having already conducted a military intervention against Libya on the basis of "responsibility to protect," and with US Secretary of State Hillary Clinton publicly contemplating a repeat intervention in Syria, the last place one would expect to find a wanted criminal, guilty of mass-murdering 2,800 innocent civilians, would be the United States. However, that is exactly where Thaksin Shinawatra is right now, last spotted in California, near Los Angeles where 2,000 Thais gathered to protest an event he planned to speak at, attended by members of his personality cult, the "red shirts." Shamefully, 2,000 Thais had to do what the US State Department should have done - turned back a despotic mass-murdering tyrant. Image: This week, Thaksin Shinawatra attempted to speak before members of his own personality cult, the "red shirts" in Los Angeles, but was picketed by protesters hoisting placards reading, "Criminal, Dictator, Murderer, Traitor, Thaksin," and "Thugsin, A Convicted Fugitive." While the US rails against Syria and its alleged "human rights abuses," one must wonder where US Secretary of State Hillary Clinton's conscience (or official responsibility) was when allowing a fugitive and mass murderer into the United States. Unlike Syria, in Thailand under the Thaksin regime, roving bands of foreign terrorists were not gunning down police and military, raiding cities, towns, and villages, and ravaging the country's infrastructure. The people he had executed in the streets in 2003 were not even protesters, peaceful or otherwise. They were regular people going about their daily lives, unarmed, unprepared, many unaware of what hit them. Image: Profound hypocrisy: Syria is fighting heavily armed foreign-terrorists committing egregious, widespread atrocities under the banner of Al Qaeda. In 2003, Thaksin Shinawatra mass murdered extra-judicially 2,800 innocent, unarmed people over the course of 90 days, approximately 30 people a day, in what he called a "War on Drugs." 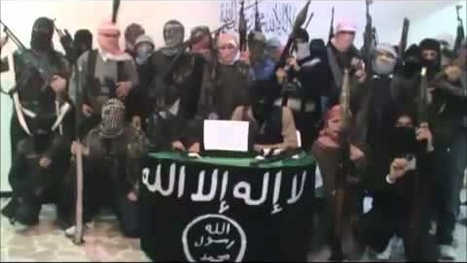 Syria, fighting dearly against the West's alleged foe of Al Qaeda faces sanctions and military attack by the US, while Thaksin Shinawatra is freely roaming the US after being granted entry to rehabilitate his "political image." "... For drug dealers if they do not want to die, they had better quit staying on that road... drugs suppression in my time as Interior Minister will follow the approach of [former Prime Minister] Thaksin. If that will lead to 3,000-4,000 deaths of those who break the law, then so be it. That has to be done ... For those of you from the opposition party, I will say you care more about human rights than drug problems in Thailand." Since this statement by the Interior Minister, Human Rights Watch is aware of at least four killings of alleged drug traffickers across Thailand - two in Chiang Mai, one in Kalasin, and one in Krabi. Readers should note that then Interior Minister Chalerm Yubamrung is now Deputy Prime Minister of Thaksin Shinwatra's sister's government, and just recently promoted his son - accused cop-killer Duang Yubamrung - to "platoon leader of a military police company." Rampant "banana republic" nepotism is a prevalent feature of Thaksin's political party - disbanded and renamed several times due to persistent voter fraud. While the United States attempts to sanction the dirt out from under the feet of Syrians and Iranians for "crimes against humanity" while they battle admittedly foreign-terrorists armed and funded by the US, Gulf States, NATO, and others, the US has granted a visa to a convicted criminal, a fugitive, a mass murderer, and a man presiding over a political machine that is to this day rife with nepotism, murder, intimidation, and sweeping corruption. Why does Thaksin Shinwatra, guilty in reality of what Syria's government has been accused of in fiction, get to wander around the United States, with a US visa, free of any consequences for the lives of the 2,800 he ended during his regime's time in power? The answer, depending on how deeply one understands the depths of US depravity, may or may not surprise you. He is remembered fondly throughout the Western press, no doubt the result of this extensive corporate-financier lobbying, as a populist and a man of the people fighting the "elitists" of Bangkok. Little if any mention of his "War on Drugs" or the 2,800 people who perished during his 3 month killing spree, is made. When it is, it is remembered as "popular" amongst the rural poor (Thailand's tragically neglected, undereducated and easily exploited rural farmers). In addition to direct support for Thaksin and his street mob "red shirts," the US State Department openly funds a network of fake-non governmental organizations (NGOs) like "Prachatai" to peddle propaganda on behalf of members within Thaksin's movement as well as movements operating on Thaksin's political peripheries, like the fraudulent "Nitirat" group, whose inaugural meeting was attended by Thaksin-lobbyist Robert Amsterdam of the above-mentioned Amsterdam & Peroff firm. Photo: Thaksin's proxy party (called "Peua Thai) headed by his own sister, ran with the slogan, "Thaksin thinks, Peua Thai does" during 2011 elections. While hailed by the Western media as a triumph of democracy, in reality a convicted criminal, fugitive, and mass-murder had won an election by proxy, via 3rd world-style nepotism. With Thaksin's sister Yingluck Shinawatra coming to power, essentially a placeholder until a pardon or amnesty can be arranged, the US and the Western media has continued to support him, as well as his sister. Thaksin is free to roam the United States, a known mass-murderer, a convicted criminal, a wanted fugitive, because he has fully committed himself to Wall Street and London hegemony - saying or doing whatever is asked of him in exchange for a license to literally kill any and all who stand in his way. What Leg Has the US to Stand On? What Legs Have We? With a mass-murderer roaming freely within the United States, the question is - what leg has the US to stand on in regards to passing judgement on nations like Libya or Syria, much less to propose or implement any type of military intervention? How can the US be taken seriously or be granted the authority to carry out military intervention in Syria when it has failed to arrest and extradite a convicted criminal, as per extradition treaties the US has signed and is now failing to honor? The answer is simply the US has no leg to stand on and it cannot be taken seriously. In fact, it is much worse than simply having no legitimacy - it is the fact that the US government has absolutely no legitimacy but still carries with it the force to carry out attacks of military aggression against other sovereign nations with such absolute impunity - in full public view. There is a catch - the corporate-financier interests, from the Carlyle Group, to the US-ASEAN Business Council and the Fortune 500 itself are all creations and perpetuations of our daily patronage of their goods, services, and institutions. They are as powerful as we've collectively made them. They will only continue to be as powerful as we've made them for as long as we continue to patronize them. The day we begin turning off our TVs, putting down the Pepsi, putting the Doritos back on the shelf, and driving past Walmart, will be the day abhorrent exercises in hypocrisy like mass murderer Thaksin Shinawatra walking freely in the United States while the US government threatens the people and future of Syria, come to an end. 2,000 Thais in Los Angeles did what the US State Department should have done - made a convicted criminal and mass murderer feel like an unwanted, unacceptable criminal. The true power of the people comes not from pulling ballot levers, but in getting organized and getting active. And while protesting does have limited benefits, we must be resolved to go further - not just demanding the communities and nations we want to live in, but cultivate the skills and institutions required to build them ourselves.